Yoga Mandir, a School of Yoga and Thai Massage, is located in San Pedro, near the University of Costa Rica, in San Jose, Costa Rica. Yoga classes for all age groups, all levels: beginners, intermediate, pregnant women, etc..
Training and certification for yoga teachers: 300 and 400 hours of training. Training workshops on Thai massage: Four levels. Since 2007 They have been providing regular yoga classes for beginners and intermediate students and advanced. They also have a 300 hours yoga teacher training program and a 130 hours of training in Thai massage techniques. 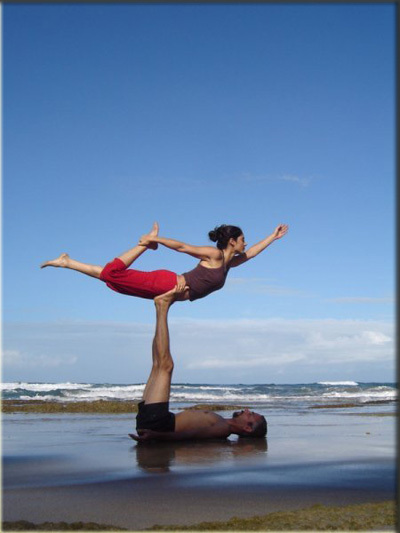 In May 2009 they opened their new space in San Pedro called Yoga Mandir, meaning the Temple of Yoga. In this space they welcome all people who are interested in starting their studies of yoga and people who want to deepen their knowledge and experience in this discipline. Here you will find general information about Yoga and Thai massage, the course descriptions and program of intensive workshops. Their teacher training program is approved by the Yoga Alliance (YA) in the U.S., making it the first program with this award in San Jose (recognized schools). The teacher training program is a rigorous, comprehensive and complete training program. It is recommended that you stay at Yoga mandir or in a near by place at least for six months to become familiar with our techniques and teaching method. It’s better if you have previously studied directly with the program director Edgar Ortiz. It is also acceptable to have studied with other certified teachers, ideally certified by Yoga Mandir School or other member of the National Association of Teachers of Yoga. Thai massage is known as passive yoga. It has developed in Thailand but is strongly influenced by the traditions of India. Instructors in Thai massage use passive stretching techniques combined with techniques of pressure on the muscles being treated. Thai Yoga massage is very effective in the gradual opening of the body, increasing mobility and flexibility, and reducing body tension, and thus increasing healthy circulation and energy to body tissues. The entire program is divided into four different levels offered each in a six-day format, with approximately 35 hours each. Open both for people who have no experience with body therapies and professionals in related fields such as physiotherapists. This level includes work in the recumbent (feet and legs), lying sideways (back and shoulders), and two-legged exercises. This course is a continuation of Level I, however you do not need to complete level one to attend this course as it is not more advanced course. Actually it’s a course where you work on just different parts of the body. In this course we will work on the facedown position. Continuation of level II. But is an advanced workshop. You need to complete level one and two to attend this course.